Warangal Black Granite is a dark grey to very dark black, fine to close-grained black basalt (dolerite) with equi-granular crystalline texture. This stone internationally may be nominated as a granite but in the area of application of the European Standard this stone must be nominated as a dolerite. During the polishing process a clear epoxy resin filler may be used to fill any micro fissures or tiny pitting however this does not affect the integrity of the stone, it merely provides an even smoother surface finish. Warangal Black granite is suitable for both interior and exterior use futhermore is frost resistant and with a constant polish. As a generalisation all black granite quarries have varying shades of black. This variation in shading is completely natural and usually occurs with the ground level of the quarry being lighter with the deeper the granite is quarried becoming darker, however some quarries may vary in shade along its length or width. The experienced quarryman knows where the lighter and darker shades are and can supply to the customer's preferences. All of our Indian black granites are from the Deccan Plateau. NOTE: It is a fact that some unscrupulous dealers will actually dye the lighter shades and try to sell them as the Ultimate Black, Premium Black or Absolute Black product at its correspondingly higher price, with totally normal usage these "doctored" blacks will lose their artificially applied darkness. To check for dying try the lemon juice or acetone test. Do ensure that the granite is washed clean before doing this otherwise it may simply be general dirt. Take a clean white rag and apply some lemon juice or acetone to the granite surface. If any residue or black appears on the rag then it has been dyed. Also, if you have several small sample choices, leave a drop of the lemon juice for five minutes on the polished surface, wipe the surface clean and observe the results, once again any dull spot or patch and the material has been doctored. Needless to say we never use colour enhancers. Warangal Black granite looks best with a gloss polished surface but is also available as honed, leather/satin, river-washed/antique, thermal/flamed, flamed & brushed, water-jet, bush-hammered, sandblast and sawn finish. Test with a small sample. It is most unlikely that a sealant can be used on this granite due to the very tight grain formation, attempts at sealing it could actually create a residue film build-up. Warangal Black granite is from sheet bedrock quarries near Warangal, Telangana, Andhra Pradesh, India. Warangal Black granite slabs are available in standard 20mm and 30mm thickness for random slabs, cut-to-size (dimensioned) slabs and prefabricated countertops to the customer's specifications, 40mm thick slabs are produced but are not usually held in stock for immediate despatch. Warangal Black granite Premium & Commercial quality calibrated, bevelled & grooved matching granite tiles. A dark-coloured, medium-grained igneous rock which contains plagioclase feldspar of labradorite composition and pyroxene of augite or titanaugite composition as essential minerals, and magnetite, titano-magnetite, or ilmenite as accessory minerals. Where olivine also occurs as an additional mineral, the rock is termed an "olivine dolerite". Where quartz occurs as an additional mineral in the groundmass, the rock is termed a "quartz dolerite". Dolerites are the medium-grained equivalents of basalts and, like the basalts, can be divided into alkali and tholeiitic types. Dolerites are commonly found in shallow level intrusions such as dykes, sills, or plugs. 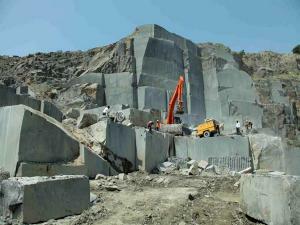 These are quarries yielding yielding several, selectable, grades of granite with blocks suitable for gangsaw size down to economical tile-sized and monument blocks. Extraction commenced in the very early 70s. For commercial projects it is important to ensure that blocks are selected from the same quarry face, do not try and match-up with alternative black granite sources.